On April 7, 2013, individuals and organizations throughout the world will celebrate World Health Day. The theme for this year is high blood pressure. High blood pressure affects one in three adults worldwide; in Colorado, 1.2 million people have high blood pressure, which is a major contributor to heart disease and stroke. 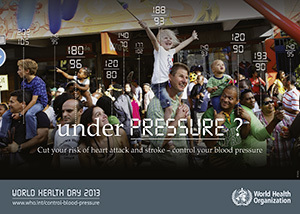 Click here to learn more about high blood pressure or to access World Health Day campaigns kits or posters.